52 Ancestors, No. 4: Anne Reibold, Bighearted Farm Woman | Photo Restorations by Tim G.
I haven’t yet planned out my year of ancestors. I might plan it, so as not to neglect some essential persons. (Who would be a non-essential person?) So far, I’ve chosen whom to write about week-by-week, and preference has gone to heroic people with great stories,for whom I have a picture suitable for restoration, and about whom, I suspect, most living people in family would not have known, but for my research. The trend continues this week, with one slight difference: This week’s ancestor is a hero of the everyday variety. I don’t expect to find her picture in the newspaper, or any recordings of her in the Library of Congress. No buildings bear her name. No gimmicks. No tricks. Don’t let any of that fool you. She’s a family hero. She is Anne Reibold. Anne’s vital records are straightforward. She was born Mary Anna Staaf, the youngest child of German immigrants, Peter and Margaret (Lotz) Staaf. One of Mary Anna’s sisters, Bertha Staaf, was my great-great-grandmother, going straight up the maternal line. Anne was my grandmother’s great aunt. Peter and Margaret’s first daughter, also Margaret, was born in Germany. The elder Margaret gave birth to two more children in Germany, one of whom died in infancy. I have yet to account for the other child; I suspect he never made it to America. Peter and the two Margarets arrived in America on the ship Adolphine on May 6, 1854, when the younger Margaret was five years old. A recently discovered and partially illegible 1860 census complicates the family story, but I know that Bertha wasn’t born until 1861, a full seven years after the Staafs arrived. Anne was born in six years later, in on August 6, 1867. Between Bertha and Anne was born another girl, Caroline, about whom I know very little. The Staafs arrived in Baltimore, and settled in Butler County, in Western Pennsylvania. I suspect the three girls in the photo above to be these three youngest. Likely a young Mary Anna Staaf. 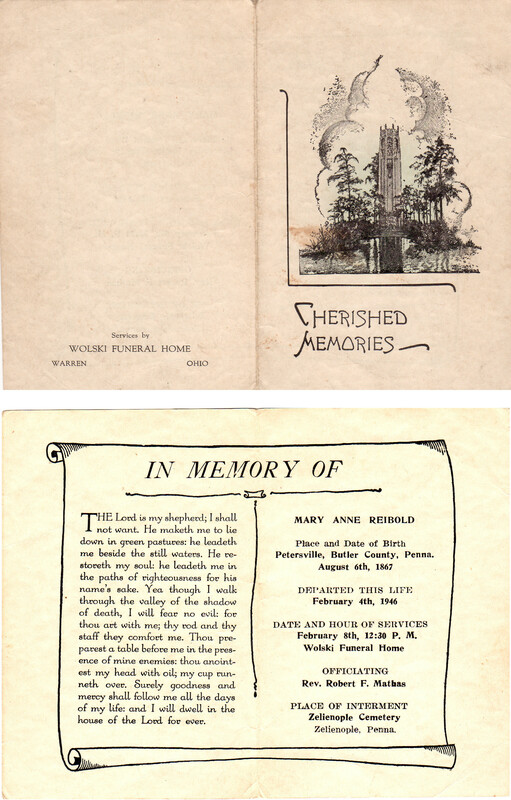 My grandmother spoke fondly of her mother’s sister, Aunt Margaret, and her brother, Henry Balmer, Jr., but she never lit up quite the way she did when she spoke of Anne Reibold. My understanding is that Anne Reibold was the one person from the older generation who was most accepting of Katherine and Nino. She would visit most regularly, offering love and support. That is my understanding, from what I can remember from what my grandmother told me, and that is why Anne Reibold is a family hero. My grandmother is now bedridden and unable to speak, after having suffered a stroke in February of 2011. She will be unable to offer more details, but I might learn more from her surviving siblings. Her youngest brother, Bob, came from California for a visit last year. He brought with him plenty of stories and three sacks of photos. I had the scanner running overtime that night. One of the pictures he brought appears above. This is a tintype photograph from, I’m guessing, around 1880, which I scanned and digitally cleaned. My great-great-grandmother, Bertha Staaf, is immediately recognizable, thanks to her distinctive eyes. She is sitting to the right of the original image and to the left of the retouched image. Bertha’s distinctive and asymmetric eyes taught me an important lesson of early photography: the resulting photograph is a mirror image of the subjects. A later photo of Bertha shows her eyes going the other way. 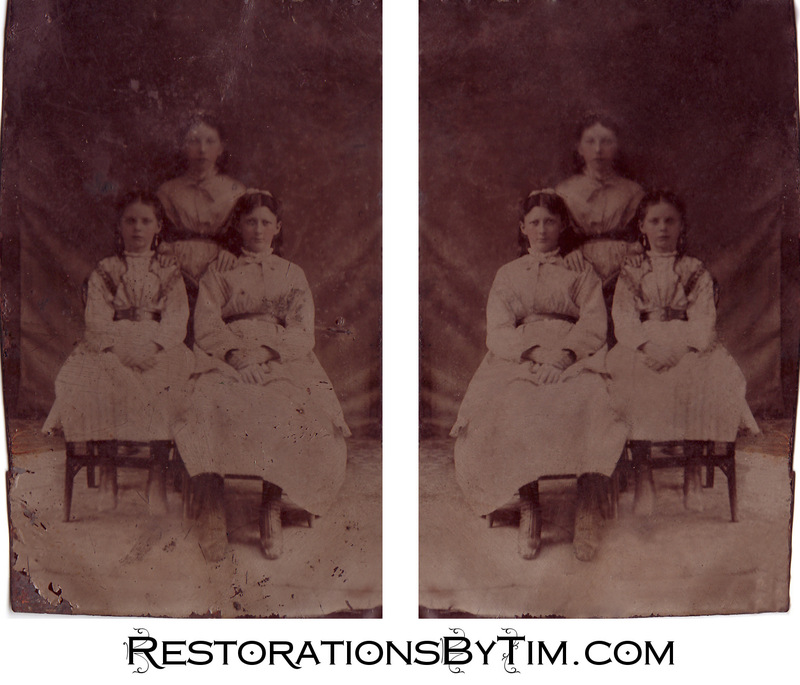 I like to reverse the tintype images in my collection, and indicate in the file name that I’ve done so. The reversed image better “reflects” how the subject would have actually appeared. Uncle Bob was unable positively to identify the other two girls in image; I suspect you are looking at Bertha and her two younger sisters, Caroline and Anne. I’m not the best at guessing ages, but I suspect that Anne, the youngest, is seated next to Bertha. I suspect that the ghostly figure standing behind them is, appropriately, Caroline. She would be the one about whom I know the least.